What's a car barn? Well, it's a garage that has the practicality of barn. It's a building that looks great in a country setting and has big parking spaces for cars, pickup trucks, SUVs, tractors, boats and more. It has extra room for tools, and equipment. It also has a loft for storage or whatever. And, it's designed for simple, inexpensive materials and economical construction. The car barns blueprints that you can order here are planned for either conventional stud-frame construction or post-frame ( pole-barn ) construction, so please check the descriptions. The Almond Car Barn Plans start with a 32'x24' main building with two big parking bays and easy stairs up to a big loft. The main building has an 8' wide door at the back to an area for your lawn tractor, bikes or hobby vehicles. There are optional 12'x24' shed-roof additions that you can build on either or both sides or across the back. They are for additional parking spaces, workshop areas or storage spaces. These plans are for pole-frame construction. 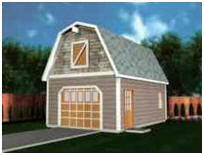 The Elm Pole-Frame Garage Plan has a 24'x24' main garage with stairs up to a full loft. An optional carport on one side and an optional 12'x24' garage, storage space or workshop on the opposite side complete the layout. The optional carport and garage, shed or shop can be built at the same time as the main garage, or can be added at any time in the future. The Walnut All-In-One Barn This versatile backyard pole-barn has a two-car garage with an extension at back for your tractor, tools and workshop. There's a 10' x 24' shed at the side and Loft for even more storage. The Candy Apple Car Barn has three 12'x24' parking bays and lots of extra space for storage or a workbench. There's a convenient loft for even more storage. 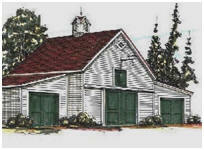 You can build more than two-dozen different layouts from this one set of pole-barn plans. The Elm Grove Car Barn has a 24'x24' two-bay garage at center, with stairs to a full Loft. Two, inexpensive, 10'x24' carports add more sheltered parking. The garage and loft are each 576 sq. ft. Total carport area is 480 sq. ft. These plans are for pole-frame construction. The Pine Knoll Car Barn This backyard pole-barn has two big parking bays, behind 9' wide by 8' high sliding doors, for your cars, trucks or SUVs. There's a side workshop. A back garage will park another car, truck, tractor or small boat. The Maple Car & Tractor Barn has a 12' x24' garage at right, an 18'x24' center garage or workshop with a full loft, and a 12'x18' garage on the left for your tractor or motor toys. These plans are for pole-frame construction. The Ashford Coach House Plans have a 38' wide by 24' deep main barn with two big parking bays and easy stairs up to a big loft. Opposite the stairs their is space for a workshop or small vehicle storage. 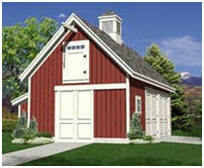 There are optional 12'x24' shed-roof additions that you can build on either or both sides of the main barn. These plans are for pole-frame construction. The Pine Pole-Frame Garage Plan is a 24'x24' two-car garage with an additional 12'x24' garage, shop or storage space on the right side. The expansion garage, workshop or storage space can be built on either side or across the back. It can also be built at the same time as the main garage or at any time in the future. The Elm Valley Car Barn has three 12'x24' parking bays, stairs to a full Loft and a 12'x24' workshop at back. The shop has an 8' wide door at the other end for your lawn tractor or hobby vehicles. 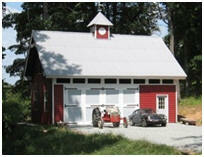 Optional lean-to sheds, garages and shops let you create your own custom car barn. Woodberry Barn and Workshop Build this small, all-purpose pole-frame building as your storage barn, garage, equipment shelter, workshop or backyard studio. It has parking spots for two cars or small trucks, an extra area for a workshop and tools and a storage loft with a convenient outside door and lift post. The Walnut Valley Car Barn This big garage will take three cars, trucks, SUVs or boats. A side shed, with its own big sliding door, will fit your tools, tractor, bikes and hobby vehicles. The drawings for the Walnut Valley Barn come with plans for a variety of sheds that you can add across the back for even more storage. These plans are for pole-frame construction.